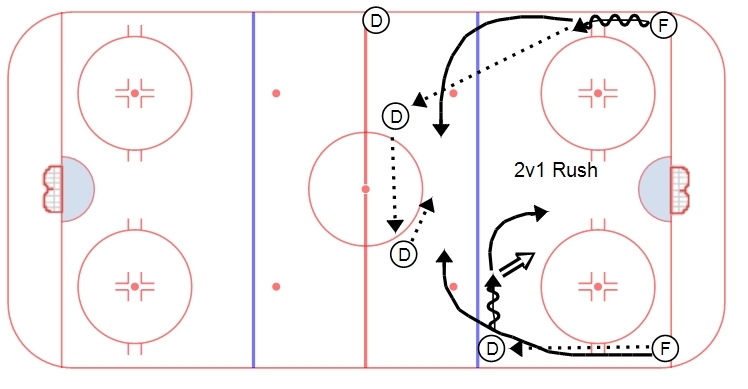 A half-ice 2v1 drill that we use as part of our pre-game warmup. It can be done in a practice setting as well, a good way to get a lot of pucks and bodies moving. Forwards start in the corners, D start in the NZ with one D on the blue line and two near the red line. A F passes to the D at the BL who walks the line and takes a shot, this forward then skates to the BL to get onside. At the same time, the other F skates up and sends a pass to the D at the Red Line. The puck moves D to D, allowing the two forwards to get onside and the D who shot the puck to pivot and gap. The two forwards then attack the D who shot in a half ice 2v1. D need to have good stick and body position, while the F’s need to attack the net with a sense of urgency to create a good scoring opportunity. Goalies see two different situations, getting a long shot from the point as well as a 2v1.